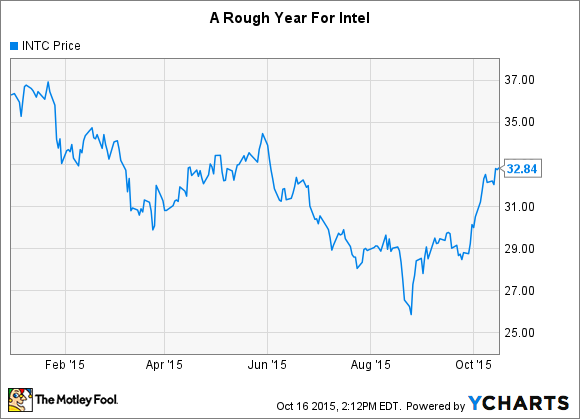 Down 10% This Year, Is Intel Corp. a Buy? The chip giant is fighting a weak PC market, and its stock has taken a hit so far this year. Is this an opportunity for investors? Chipmaker Intel (NASDAQ:INTC) has disappointed investors so far this year. The stock is down about 10% since the beginning of 2015, and that's only after a major rally over the past month. A few weeks ago, Intel was down 20% year to date, and at its low point in August, the stock had tumbled more than 30%. Meanwhile, the S&P 500 is down less than 2% this year. With shares of Intel underperforming the market, is it time for investors to swoop in and buy the stock? Intel still derives a large portion of its revenue and profits from PCs, but things are changing. While the PC market remains weak, driving down revenue in Intel's client computing segment, revenue from data center customers is growing at a double-digit rate. Over the past nine months, the data center segment generated more operating profit than the client computing segment, a sharp reversal compared to the same period last year. The client computing segment includes tablet and smartphone processors, which were previously contained in a separate segment. This mobile segment, which Intel combined with the PC segment this year, generated just $202 million of revenue and a $4.2 billion operating loss during 2014 thanks largely to Intel's heavy subsidization of its tablet chips. Intel is attempting to improve mobile profitably by $800 million this year, but even so, client computing operating profit slumped by 20% year over year during the third quarter. This means profitability in the PC portion of the segment likely fell by an even greater percentage. The PC market will eventually stabilize, and Intel is in a truly enviable position in the industry. Intel and competitor Advanced Micro Devices (NASDAQ:AMD) are the only two companies that can make processors for Windows PCs since Windows desktop applications run on x86 processors. With AMD struggling to survive, reporting another quarter of falling revenue and big losses, Intel's dominance is unlikely to be seriously challenged any time soon. There are parts of the PC market, like 2-in-1 devices, that are growing, so even with flat or falling volume, higher average selling prices could buoy Intel's PC revenue going forward. In the mobile processor market, Intel doesn't have the same built-in advantage. Android can run on either x86 or ARM processors, meaning Intel has a far greater number of competitors compared to the PC market. Intel does still have a manufacturing lead over third-party foundries, and given that most ARM chip designers outsource manufacturing, the company has an edge in that area. In the long run, I see no reason Intel can't be competitive in the mobile market, but with so much more competition, its profitability will likely be lower compared to its PC business. Beyond PCs and mobile devices, Intel's data center segment is the crown jewel of the company. The segment is expected to grow by a low double-digit percentage annually, down from a previous target of 15%, with strong demand from cloud computing companies offsetting weakness elsewhere. Intel's data center operating margin was an incredible 51.4% during the third quarter, down a bit year over year, but impressive nonetheless. Intel dominates the market for server processors, with no real competition at the moment. There are, however, a few long-term threats that could lead to market share losses, lower profitability, or both. ARM Holdings has a goal of winning a 20% share of the server chip market by 2020, and a variety of companies, from AMD to Qualcomm, are working on ARM server chips. This goal does seem overly optimistic, but ARM is a real threat to Intel, particularly at the low end of the market. Attacking from the high end is International Business Machines (NYSE:IBM), which is making a renewed effort to get its Power chips into hyperscale data centers. IBM founded the OpenPOWER foundation two years ago, an effort that now boasts about 150 members, with the goal of creating an ecosystem around IBM's Power processors. IBM recently launched a new line of Power servers running Linux based on OpenPOWER, which boasts about twice the performance per dollar compared to Intel chips for certain Big Data applications, according to IBM. AMD is also attempting to get back into the server chip game, with its new Zen CPU core expected to launch sometime next year. Whether ARM, IBM, or AMD will be able to win significant market share from Intel is an open question, but Intel's lofty margins would almost certainly take a hit if it were forced to lower prices to stave off the competition. In the long run, it's hard to imagine Intel's utter dominance of the server chip market going unchallenged, and there's a major incentive for companies that buy Intel server chips by the thousands to have a viable alternative. Over the past 12 months, Intel has earned $2.34 per share in GAAP earnings. With a stock price around $33 per share, this puts the P/E ratio at roughly 14. Analysts aren't expecting any earnings growth at all in 2016, with growth of the data center segment likely to be cancelled out by weakness in PCs and continued losses in mobile. Whether or not Intel is a buy depends on your opinion of the company's long-term growth prospects. In the PC market, any growth will likely be slow, but Intel's dominance is unlikely to be seriously threatened. In the mobile market, I expect Intel to eventually become a major force in the smartphone processor market, but profitability will likely be less impressive than PCs. And in the data center segment, I suspect Intel's near-monopoly won't last. The Internet of Things offers another growth opportunity, albeit one that's much harder to quantify. Of course, predicting the future is hard, and one or all of these predictions could end up being way off-base. But I'm not confident enough in Intel's long-term growth to buy the stock at its current price.